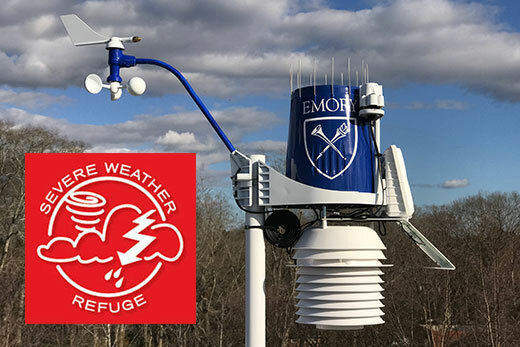 In order to enhance Emory’s ability to track changing weather conditions, the Office of Critical Event Preparedness and Response has installed several weather stations on Emory’s Atlanta and Oxford College campuses. Severe Weather Awareness Week in Georgia is Feb. 5-9, which offers an opportunity for the Emory community to review campus emergency plans for what to do in the event of disasters, according the Office of Critical Event Preparedness and Response (CEPAR). Tornadoes and severe weather can occur at any time. During 2017, a record number of tornados touched down across the state of Georgia, says Sam Shartar, CEPAR senior administrator. The best plan is to learn about community resources now, before weather events strike, says Shartar. “Knowledge empowers people. If you take time to think through what to do in advance, you’ll be better prepared to take care of yourself and those around you until you can get help,” he notes. Springtime can bring an array of stormy weather, from late cold snaps, dangerous winds and severe thunderstorms to lightning, hail and flash flooding — all of which can create hazardous conditions. That’s where Emory’s emergency notification system comes in, enabling the university to send emergency notifications quickly and efficiently through multiple channels, including text messages and email, outdoor sirens, social media, RSS messages to webpages, and cable messages directly to Emory Cable Television. Emergency alerts are also sent to Emory’s safety app, LiveSafe. Developed for smartphones and tablets, the free app provides a quick, convenient and discreet way for students, faculty and staff to communicate directly with Emory University public safety officials. There is also information that provides guidance on what to do during an emergency. The campus community is encouraged to download the app here. In order to enhance Emory’s ability to track changing weather conditions, CEPAR has also installed several new weather stations on Emory’s Atlanta and Oxford College campuses. Knowing what to do in the event of a tornado warning or dangerous winds, being aware of where shelters are located on campus, reviewing CEPAR's online resources, and downloading a weather app — some are free — to your smartphone are all steps that anyone can take now, Shartar says. While less common than tornadoes or severe thunderstorms, ice and snow events can also have a serious impact in the Atlanta area, Shartar notes. Keep a winter weather kit in your car with items that you may need if you become stranded on a roadway, including blankets, water bottles, a small shovel and kitty litter, for traction on ice. In the event of a utility failure, do not attempt to correct the problem on your own. Immediately notify Emory Police at 404-727-6111 or call Campus Services during regular business hours (8 a.m. to 5 p.m.) at 404-727-7463. Download the LiveSafe Safety App.